Asserting that regional parties will play a major role in national politics, the Telangana chief minister's daughter and TRS leader Kalvakuntla Kavitha Wednesday said time had come for the emergence of a "neutral front" free of the BJP and the Congress. She made it clear that the Telangana Rashtra Samithi is neither a part of a coalition being floated by Congress nor any party's 'Team B'. Addressing a press conference, the TRS MP, 40, also said the Congress' recent victory in Madhya Pradesh, Rajasthan and Chhattisgarh was not a "mighty" show of its strength but reflected the national party's "pitiful state". She added that some regional parties that are part of the so-called Congress-led coalition are opposed to the idea of proposing Congress chief Rahul Gandhi as the prime ministerial face for the 2019 Lok Sabha elections. Highlighting the state issues waiting to be taken up in the ongoing winter session of Parliament, Kavitha said, "In future, we will see regional parties have a greater role in national politics because what national parties can't do, regional parties are able to." Joined by eight other MPs of the TRS, the daughter of K Chandrashekar Rao said the TRS will certainly play a greater role in national politics. "We are working for a coalition that is free of both the Congress and the BJP. We are not 'Team B' of anything, we are 'Team B' of Indian people," she said. Kavitha stressed that the need of the hour is to have a "neutral platform" because the current NDA government has also "failed miserably" to implement various promises like women's reservation. "So this is a time when a neutral platform should be established which is free of both BJP and Congress... We will certainly work. We will make sure we will form an alliance that will not have the BJP or the Congress," she said. Asked for her views on the DMK proposing Congress chief as PM candidate from the anti-BJP coalition front that is still in a formative stage, the TRS leader said, "We are not part of that grouping." "From that group, two regional parties have already objected to his name (Rahul Gandhi). So this is not about one person becoming prime minister or one party rising to power, it is about truly addressing the people's issues," she said. 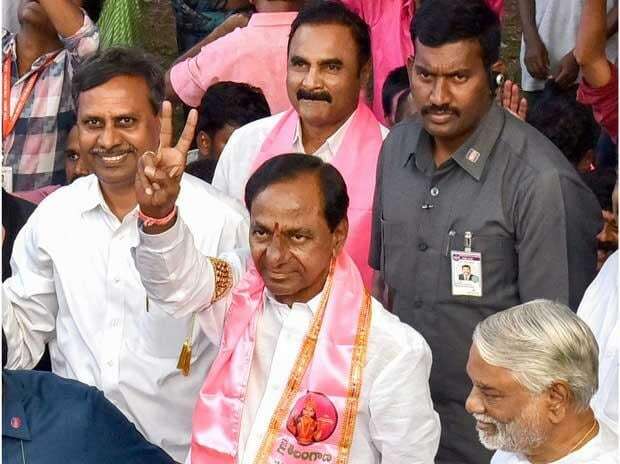 The TRS leader also recalled that her father had called Gandhi a "buffoon" when he broke norms in Parliament and hugged Prime Minister Narendra Modi. "It was a silly move and the whole nation watched and laughed at him (Gandhi)." Kavitha said the TRS has done good work in Telangana by focusing on people's issues and the party wants to make sure that a similar work can be replicated at the national level. Asked about the Congress' resurgence in three big states, Kavitha said, "It was not a clear victory. This does not show a mighty Congress. It shows the pitiful state of the Congress where only default politics is the current state..."
In Madhya Pradesh, it was a 20:20 match, she said. In Rajasthan, the Congress expected a landslide but it barely scraped through, she added. In her view, had there been a regional party in these states, it would have played a major role. Jithender Reddy, the TRS party floor leader in Parliament, said the party has identified pending issues such as bifurcation of the high court and 12 per cent reservation to Muslims which will raised in both the Houses. Asked if the party will raise the Rafale deal in Parliament, he said, "We are only interested in Telangana. We don't have time for all these things." The TRS has nine MPs in the Lok Sabha and three in the Rajya Sabha.